Mis Trucos (which means "my tricks" in Spanish) is a Mediterranean tapas restaurant that opened up about five months ago. It is the creation of Kris Barnholden, a former sous-chef of Parkside; also on board is GM Eryn Dorman (from Fuel) and barman Jonathan James (formerly of Uva). Mis Trucos is located up a flight of stairs on the second floor of a converted 1920’s character house, right next to the Shoppers Drug Mart on Davie (the location of the former Davie Village Café). The decor is clean and simple: white seating, natural wood tables and bar, with art covered white walls. It's cozy and candlelit, and was toasty warm; it feels like you are over at a friend's for dinner. The menu consists of seafood crudos, tapas, share plates and a few mains. The nice part about the tapas is that you can order just one (should no one share your desire to try a particular item), or they can be ordered as a set of four. I started with a refreshingly tasty gin gin mule cocktail: gin, house made ginger beef, mint, lime ($9). 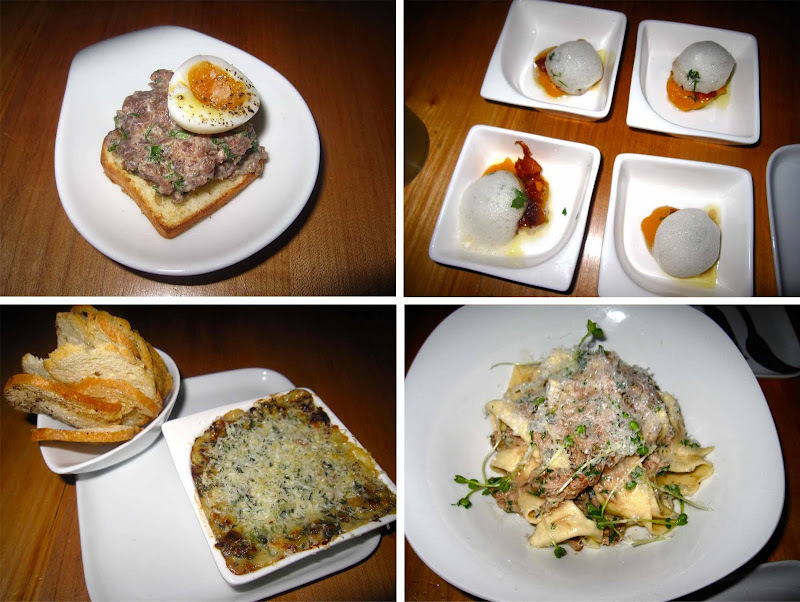 The friend I dined with is not a big beef fan, so I ordered one of the wild venison tartar, brioche, truffle + quail's egg ($3.70), and to share we ordered four of the qualicum scallop, squash, crisp ham, parmesan ($10), the pine-nut, raisin, spinach + parmesan dip with crostini ($7), and the braised chicken + porcini mushroom papardelle ($16). Everything on the menu is under $20. Both the tartar and scallops were delicious, each individual tapa presented beautifully on white dishware; our plates were left sparkling clean, we were literally using our fingers to lick the squash purée out from the scallop dish (in which the crisp ham was a nice addition) and wanted to order four more right away. The dip was a tasty follow up, served hot and fresh, the raisins add a nice sweetness; they also brought us extra crostinis to finish off the dish. The pasta was good with lovely presentation, but was also the only menu item of the night I wouldn't re-order. The papardelle was really fresh and cooked to the right tenderness, but the braised chicken could have been more flavourful; we agreed it was too closely reminiscent of tuna, more so in texture, but also likely due to our expectations of the flavour, which we both assumed would be a bit more like a rotisserie chicken flavour. The service was great, friendly and attentive, our server made sure we were enjoying our meal. Also, for those of you with iPhones, you can get 20% off of your bill if paid through Mobio. From other reviews I've read about Mis Trucos, it appears as though the menu changes, and there were many dishes mentioned that I would love to try. Tasty, tasty, tasty, I will go back for more.